The year is 2017, and this is Memorial Day weekend. For some, this may mean a Monday off work, a barbecue with friends, a get-away weekend, and perhaps maybe even flag flying. For many, this day blends right in with veterans day and is just another day to thank everyone who served in our military. The history of this day has changed. Originally called Decoration Day, it was started after the American Civil War as a way to honor Northern soldiers who died in that conflict. Later it was renamed Memorial Day and was used as a day to honor all of those who fell in the service of our Nation in any war. The date for Memorial day was always May 30th, until a bill was passed in 1968 making three day weekends which moved the date to the last Monday in May beginning in 1971. Don’t get me started . . .
Saying thank you is generally always a thing to be encouraged. 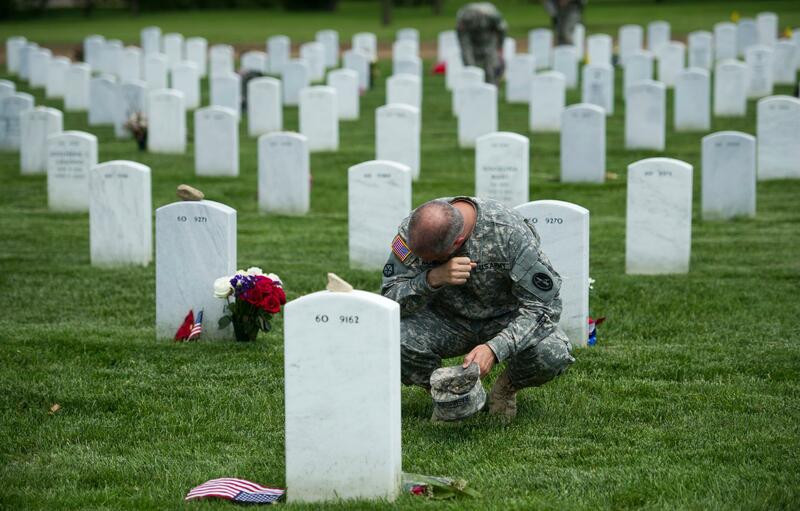 But the thanks due on Memorial day has a particular focus. This is not just a general day to thank vets. That is always important, but that is not what this day is about. Memorial day focuses remembrance on the men and women who answered the call to serve their country in wartime and who died in that service. If you have lost someone near to you, grief is something you are all too familiar with. If you are yourself a veteran, memories of your fallen friends can haunt you and bring tears. If you are a child of a veteran and perhaps a soft touch like me, you may find yourself sympathetic to this one line from a poem by Thomas William Parsons, entitled For One Who Fell in Battle. If you can play the bugle, you can get in touch with veterans groups and see if they need a bugler to play taps at a cemetery’s Memorial Day Service. If you are a bugler, you can also audition and volunteer to play taps at a veteran’s funeral. You can find out about what is entailed in doing this by contacting Bugles Across America here: Volunteer – Audition at Bugles Across America They are always recruiting new buglers to play at military funerals. You don’t need to be a military veteran to do this. You can also donate to provide support to the widow/widower and surviving children of fallen service members. This may take a little effort on your part. Many worthy organizations provide such support, but you should do due diligence to make sure that they use donor money appropriately. You can go to Guidestar and type in: families of fallen veterans, and you will get a list of a variety of non-profits that provide support. They rate the efficiency and targeted focus of various organizations, and you can see which organizations will best suit your criteria for giving. 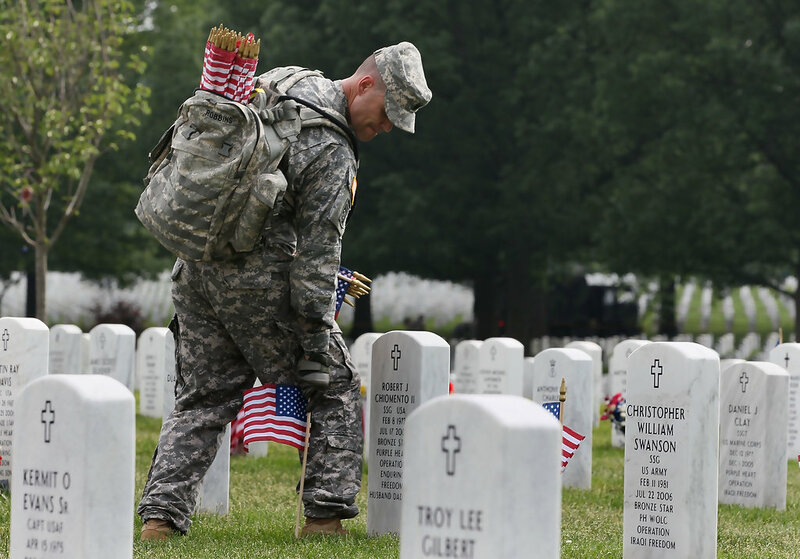 You can place flags on graves: you might contact a cemetery or veterans group and see if they could use some help in placing flags on the graves of those who have fallen. Finally, one last thing. As I read this out loud to my husband, who is a Vietnam veteran, I was reminded painfully of one more thing as I watched his tears flow. Don’t forget to comfort those who lived, who were able to come home from war. 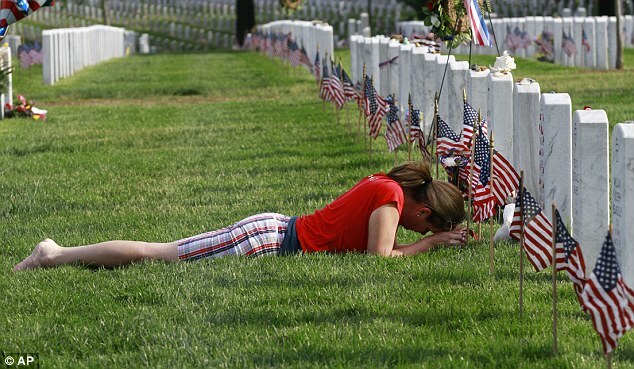 This weekend may be very hard for them as they remember their brothers and sisters who were not so fortunate. This entry was posted in Courage, Responsibility, Sacrifice, War and tagged Death, Freedom, Funeral, Grief, History, Memories, Thanksgiving, Veterans, War. Bookmark the permalink.